Mix well until the chicken is coated with the marinade and set aside for at least 1 hour or preferable overnight. In a blender, blend rempah ingredients and ground finely. Over medium heat, frs stirring continuously to prevent sauce from burning until aromatic. Add water and cook for another 3 minutes. Pour in Coconut Milk, sugar and salt and simmer over a medium fire for 5 minutes. Grill the chicken over a low charcoal fire or under a grill (griddle pan or charcoal grill), basting frequently and repeat this process of coating the chicken with gravy, until the chicken is cooked. Serve Ayam Percik while hot with steamed rice. can i bake this chicken instead? yes by all means. it would be aromatic and delicious too. 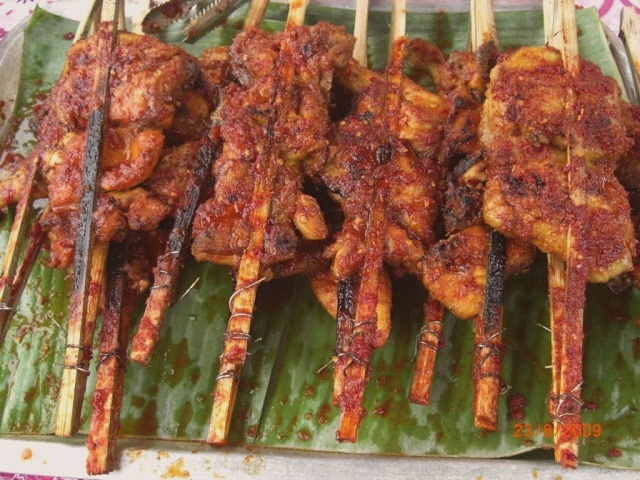 but i would prefer to grill Ayam percik over the charcoal fire. its like grilling satay. original taste. original procedure in bbq terms.